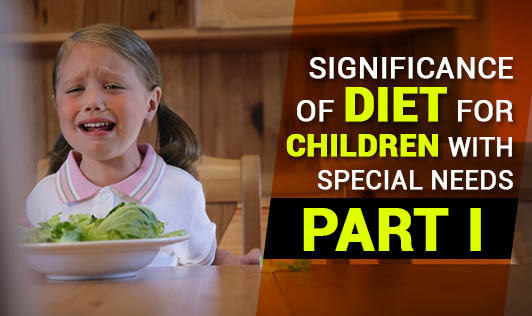 This article aims to educate caregivers of ‘children with special needs', about the importance of a healthy diet, specifically for children with Autism and ADD (Attention Deficit Disorder). 1. A high-protein diet, including beans, cheese, eggs, meat, and nuts is highly necessary. Add protein foods in the morning and for after-school snacks, to improve concentration, and possibly increase the time-period effect of ADHD medications. 2. Fewer simple carbohydrates, such as candy, honey, sugar, and products made from white flour, white rice, and potatoes (without the skins) are easier to digest. 3. More complex carbohydrates should include vegetables and some fruits (oranges, pears, grapefruit, apples, and kiwi). Eating complex carbs at night may aid sleep. 4. Include more Omega-3 fatty acids, such as those found in tuna, salmon, walnuts, olive oil, and canola oil. Omega-3 fatty acids are also available in the supplement form. 5. Although, the effect of sugar on attention-disorders remains controversial, sugar has been known to lead to behavioural effects. Thereby, the benefits of decreasing sugar consumption (e.g., improved dental health) should be emphasized. 6. Further, elimination of some common allergy-inducing foods like cheese, nuts, wheat cereal, and chocolate and replacing them with hypoallergenic foods like lamb, potatoes, carrots, and pears could also reduce ADHD symptoms. In short, replacing unhealthy foods such as red meats, fast food, and high-fat dairy products with a "healthy" diet rich in fish, vegetables, whole-grain foods, fruits, and legumes should help relieve symptoms for kids with ADHD.